I just discovered your site when I was researching a sci-fi/horror flick I remembered being traumatized by when I was a kid (turned out to be Strange Invaders—you know which scene I’m talking about), so I was hoping you might be able to help me figure out another obscure trauma. I’m afraid the details are sketchy since I was probably 4 or 5 when I saw it. It was on cable, probably HBO, in the early-’80s. I remember late one night happening upon the end of either a movie or a short film in which a mother with short curly brown hair I believe had killed her family and, at the point I tuned, was in a life and death struggle with her teenage son on the stairs, trying to stab him with a kitchen knife, which he wrests away from her and proceeds to stab her with in self defense. Of course she pops up for one last scare, screaming bloody hell, forcing him to finish her off. It was chock full o’blood and screams and quite disturbing. Naturally, I must know the name so I can track down a copy to watch in full. On Facebook Timothy Tomkins suggests NIGHT WARNING (aka Butcher, Baker, Nightmare Maker, 1982)! Love that guess and that movie! Hope it’s right! All humans should see NIGHT WARNING! Susan Tyrrell is incredible in it!!! You beat me to it! That was my first thought. Another on the Video Nasties list. I was heart broken last year when Susan Tyrrell died. There will never be another like Tyrrell! NIGHT WARNING is one of the best and most unusual horror flicks of it’s time. I’ll always remember having the movie tie in paperback (with the BUTCHER, BAKER title) confiscated from me in jr. high! I got it back and I still have it!!! The two images weused today are from GROTSEQUE (1988) with Linda Blair and Donna Wilkes. 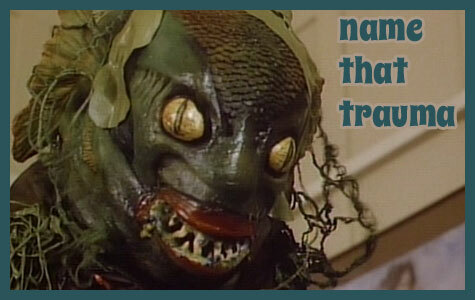 The fish guy is just a prank costume but the real monster does not look much more convincing. I remember having high hopes for GROTESQUE due to a full page ad on the back of a horror magazine (maybe Gore Zone?) and being so disappointed when I first saw it. Of course now that a couple of decades have passed its rottenness has turned into awesomeness and you can’t beat getting both BLAIR & WILKES in one movie! Hey, that makes me think that if the answer today does turn out to be NIGHT WARNING than my images are once again psychic because both WILKES and TYRRELL starred in ANGEL (1984)!!!! I’m impressed. Seriously impressed. Why was the book confiscated from you, Unk? Just for content, or were you reading it during class? I’m sure I was reading in class! I do remember I used to write horror stories and illustrate them with nasty death scenes and those were definitely confiscated due to content! I had to see a guidance counselor over those and I don’t think I ever got them back! If you approach GROTESQUE as comedy you can’t go wrong. There’s a biker/punk gang in it and they are hilarious. It’s also a sort of home invasion flick and those always get to me a little even when they are not done well! I’m really glad you are enjoying the site and the content! I worry sometimes I might be chasing readers away with my taste! I remember watching Grotesque on USA’s Up All Night. If memory serves, it was hosted by Gilbert Gottfried. At least I know it was when they showed Black Roses. Unk — Ha! Good man, but lame that you never got your stories back! Did you just forget about them as you moved on to high school, or did you actually attempt to repossess your work? Wow! This got me to go watch Night Warning… and what a hoot that was! What a good (and odd) little movie. So many great little details… and the script is pretty clever. I liked that it seemed to draw a bit of a parallel between Billy’s mom’s insanity and the sheriff’s homophobia. I’d heard of Ms. Tyrrel but really hadn’t seen her in action before… she was so good in Night Warning… getting progressively crazier. That final kiss just before she ‘dies’. I’m gonna have to go track down more of her work. Susan Tyrrell was a one of a kind. My favorite piece of her work was Richard Elfman’s Forbidden Zone. Seriously, if you haven’t heard of this bizarre flick, you are sorely missing out. I also think of her in the Vincent Price flick, The Offspring AKA From a Whisper to a Scream. Her actual personality was a bit rough around the edges too. She would say things to you that would make a sailor blush. Oh, and about Black Roses, it was famous in its day for the hard plastic 3D VHS cover that you couldn’t possibly store sideways on your video shelf. I still love the soundtrack all these years later, even if the movie is a turd. But it’s a good turd. I miss UP ALL NIGHT and the early days of cable. Somebody like FEARnet should try to bring back movie hosts. Here in Philly we had “Saturday Night Dead’ and it was the best. I would love to see all those stories and drawings today. I still have a couple that I savedI Maybe one day I’ll scan them and share them on the site. Pretty funny stuff. I’m so glad you watched NIGHT WARNING! Nothing makes me happier than introducing somebody to a movie they might have missed. It really is a gem and so interesting when you think about the time it was made. The gay element especially was very unusual for the time. In fact when I was a teenager I rented NIGHT WARNING and THE EVIL DEAD and watched them both for the first time on the same night and I remember thinking NIGHT WARNING was the much better film! if you told me then that decades later it would be virtually forgotten while EVIL DEAD would go on to become a beloved classic, i would have thought that insane! Yay FORBIDDEN ZONE! I also love her in this Drew Barrymore movie called FAR FROM HOME. She’s amazing in that, screaming at her kids to about “Aquaman fish sticks”! I remember that awkward BLACK ROSES box! Another favorite box was THE DEAD PIT with blinking eyes! Popcornmonster — I’ve heard many great things about “From A Whisper To A Scream”, so that film a viddy is definitely high on my to-do list. I’m actually not sure whether I have or not, so I gotta determine that pronto, but thank you again for seeding it back into my consciousness. And I definitely want to check out the “Black Roses” soundtrack! Unk — Philly, eh? I’ve only been to touristy New Hope (birthplace of Ween), and I’m aware the rest of the state can get a bit sketchier to say the least. However, I do very much appreciate the keenness of an East Coaster, indeed! Props to you! That was it! I love the interwebs. All I remember seeing of it was that last scene. Been burned in my memory since I was 5. Thanks, Unk, Tim Tomkins, and popcornmonster! That is awesome! I’m so glad that it turned out to be the right movie! Thanks for sending in your NTT and getting us talking about NIGHT WARNING!!! It’s hard to believe but I was a little disappointed when I saw EVIL DEAD for the first time! Stephen King wrote a rave review for it in Twilight Zone magazine and it got my expectations up high that it would scare me like The Exorcist! Instead, I thought it was good but I never really felt it was believable and …I thought it looked too cheap! Lol. Then I fell in love with EVIL DEAD 2 which I saw with the greatest audience and it made me appreciate the first one. I’m not sure I’d still rank the one above the other but at the time, as far as the story and characters went… I was way more impressed NIGHT WARNING! Susan Tyrrell will do that to a person! Ok so see now our differences in taste are coming into play, which is a good thing since I think it makes the discussions here even more interesting. Does “Night Warning” have more character development than “The Evil Dead”? Yes, and often this would make me prefer the former. But when you stack it side by side with a film chock full of such raw ingenuity, inventiveness, and brutal violence (even if some of it does appear cheap — though you gotta love that beauty of a pencil stab in the ankle), my choice for an easy winner is TED. Now, having said that, I’ve yet to finish “Night Warning”, so perhaps all of this will be moot once a demon hand shoots out of the guts of ol’ Billy Lynch, spraying the walls of his house with blood and intestines. I agree with every thing you said about Evil Dead- it’s a great movie! I just remember not loving it the first time I saw it. As a teenager I really did prefer glossier horror. HALLOWEEN was my thing and stuff like LAST HOUSE and TCM really pushed my limits. I now believe TCM is a masterpiece but at the time I first saw it- it was just too ugly- of course now I think every frame is beautiful. I always kind of shake my head when people judge movies as “good” or “bad” because you never know how your perceptions will change! My expectations were very high when I first saw Evil Dead- too high in fact. I watched it thinking it was going to be something else and that hobbled it for me. All that campy early stuff in the car? It just, at the time, seemed really amateurish and it took me out of the film. Nowadays I try to just judge a film on how well it succeeds in doing what it sets out to do rather than against other films. Still, if I had to vote, I’d go for Night Warning just because of Tyrrell’s performance and the storyline being so against the grain. I agree there’s nothing in NW as horrific as that pencil bit in ED. I just watched it again recently and that scene still works so well! Unk, reading your responses is sometimes eerie as you often mirror my own experiences. When I first saw TCM at the age of 13 or so, I recall not liking it for the same reasons. It was just too real and rough. I realized later that those reasons were exactly why it was a good film. It accomplished what it set out to do. I also recall not being too impressed the first time I saw The Thing. Why, I don’t know now since it really is a great fun film. On the other end of that spectrum though, I recall loving the sequels to Sleepaway Camp but when I watched them years later I was shocked at how stupid they were. I was actually nauseated by TCM! It made me queasy! Lol. I never thought I’d watch it again which is crazy because I’ve seen it a million times now. I did experience love at first site with THE THING though. The effects blew my mind! But I also remember thinking the final battle with the Blair monster was unsatisfying compared to all that came before it. Now I know that particular effect fell through and that explains it. I LOVE that movie but when people were calling it “perfect” when the redo came out I thought that was nuts. THE FUNHOUSE is another example. I was really let down by that one after reading the book and then years later it became one of my favorites. It seems insane now that I couldn’t see how beautiful it was the first time I saw it! I really had an epiphany with it! It was like all of the sudden I could SEE and everything just clicked into place! I don’t know if time is kind to these movies or if I just approach them differently now. It seems my expectations have really effected my enjoyment in the past so now I try to just go in as blind as possible and go with the flow rather than try to steer things in my head! I still enjoy the SLEEPAWAY sequels but I tried to get John to watch part 2 and he didn’t get it or find it funny at all. I had to turn it off! It was embarrassing! In the remake, I so very badly wanted it to end with the demons breaking through the back of the cabin and attacking the lone survivor, preferably killing her. (I like my horror movies to have no survivors. At least no protagonistic survivors.) But alas, no banana. D’oh! I meant for my comment regarding “Evil Dead” above (second paragraph) to be surrounded by spoiler alerts, but I used HTML comment tags to do that and so it looks like they were interpreted as such by the text parser. By coincidence I bought and watched GROTESQUE in the last 2 weeks. I think the title applies to the dopey ending more than anything else. Anyway, the gang that goes after Blair and Wilkes in the film are called “punkers”. The leader of the “punkers” has blonde hair and looks like a Billy Idol wannabe. The way the actor who played him overacts is hilarious.